The snow has finally melted and spring is definitely in the air. 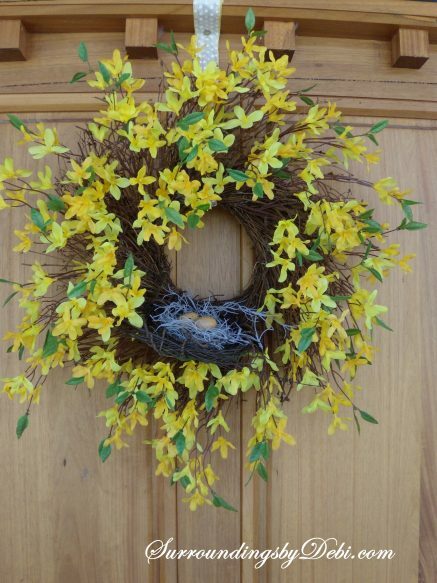 My thoughts have turned to spring decorating and what I am going to put on the front door. I went to my “go to” stores to see what I could find and kept eyeing a lovely forsythia wreath that just invoked the spring feeling for me. While the prices can be affordable, the creator in me just wanted to make this myself, especially because I knew it would be an easy project. So here we go – Let’s make a Forsythia Wreath! 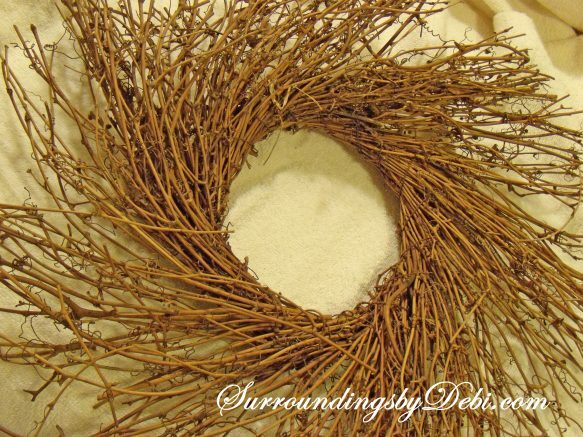 We’ll start with a simple twig wreath I purchased at Hobby Lobby. I didn’t get the largest size, but for a larger space you could. The one I chose was the medium size. Next I bought the forsythia bushes Hobby Lobby sells as well. They were only around $5.99 when purchased during their 50% off floral sale. 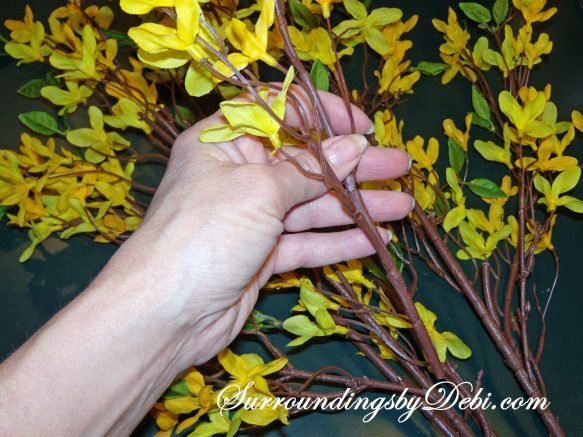 There are a ton of branches on this particular bush. All of the branches were cut apart, in a variety of different lengths, using wire cutters. 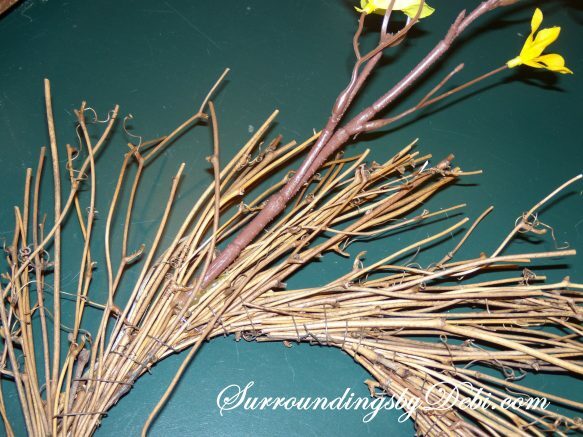 After I dipped the end of the branch into hot glue, I then began gluing each of the branches in the wreath, tucking the end of the branch as deep as possible into the branches of the wreath. 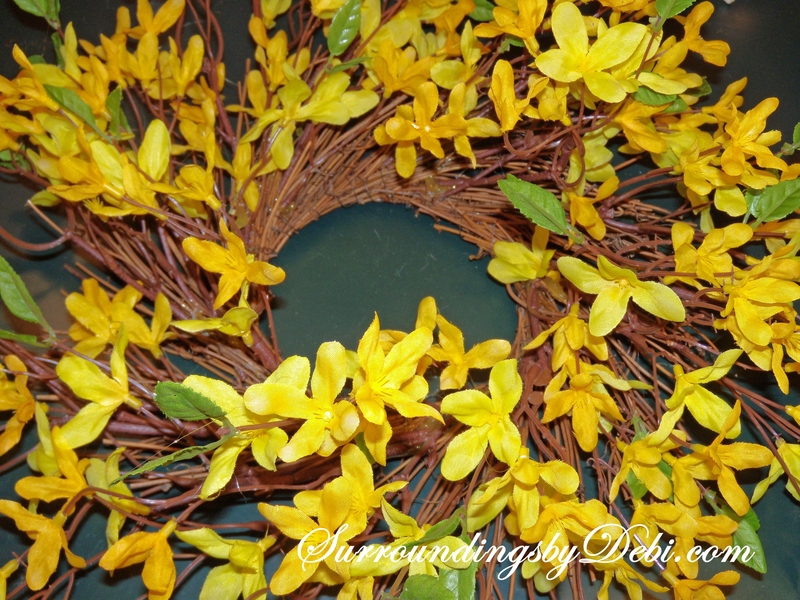 Working around the wreath, I continued to glue the forsythia branches into the twig wreath until I had covered the wreath entirely. 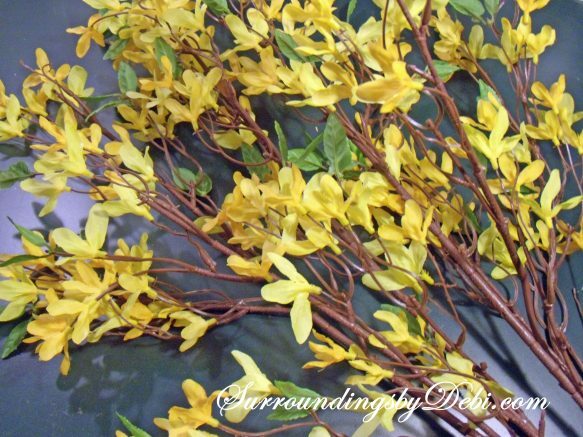 About 1 ½ bushes of forsythia were used. 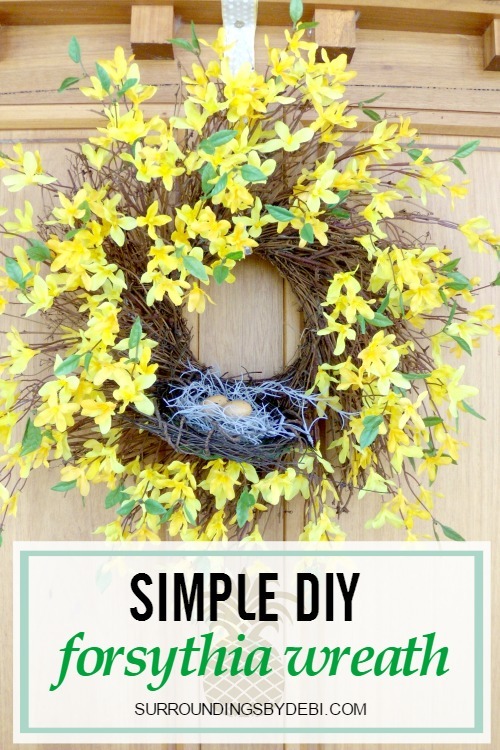 Then cut a few of the single blossoms from the branch and glue them in the center of the wreath to cover the glue, and fill in the center of the wreath. 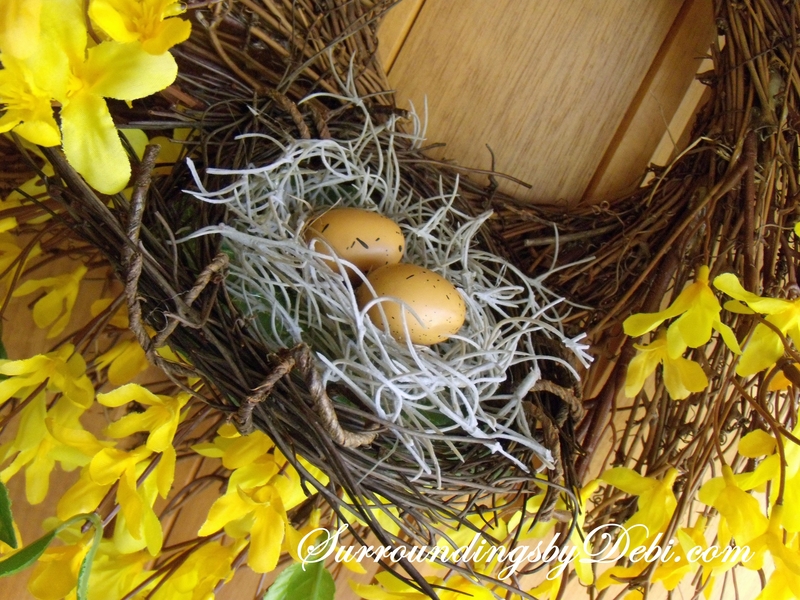 I wanted to add an additional touch of spring to the wreath and inserted a bird’s nest with eggs that I had created out of scraps. 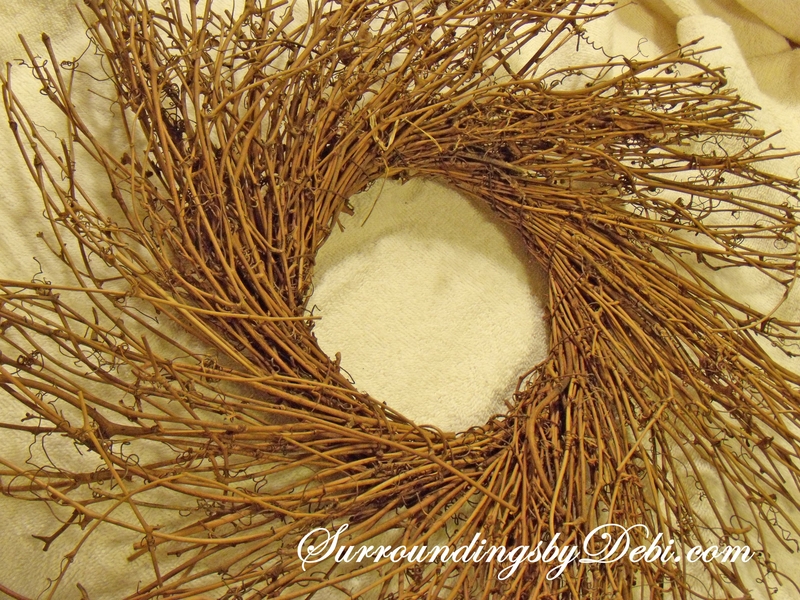 I wired it securely to the bottom of the wreath using brown florist wire. You can find out how the nest was made HERE. 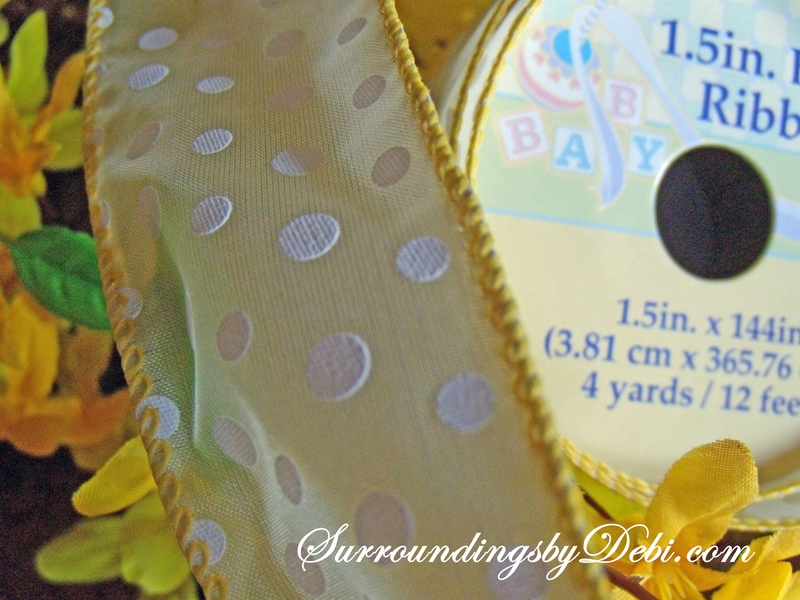 Next a loop of ribbon was added to hang the forsythia wreath, using this cute yellow polka dot ribbon I found at the Dollar Store. And here it is on the front door. I am feeling the warmer days already! 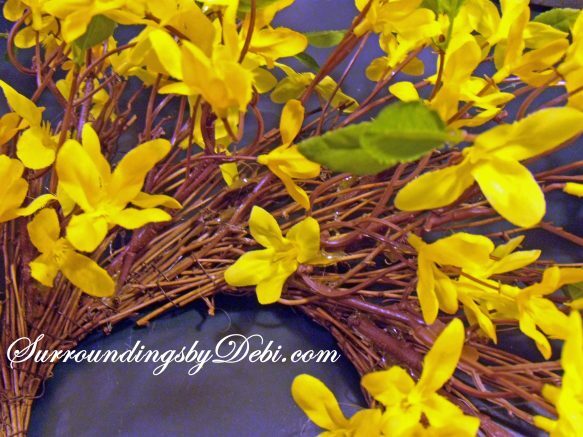 Please share what simple ways you are using to bring spring into your home.